Petals 5, white to pinkish, nearly circular, ¼–½” long [6–12 mm]; sepals apparently 10; stamens 20–25; berry up to ½” long [12 mm], bearing seeds on its surface; most leaflets minutely hairy on top, veins recessed; leaves ternate, toothed coarsely and ± evenly, on hairy leafstalks; 3–8″ tall [7–20 cm], with long reddish runners. Habitat: From low forest and aspen groves to subalpine basins; moderately shade-tolerant; ALL. Natural History: Being the common strawberry of Europe, this is the one served for beaucoup de Euros at Michelin-Four-Star restaurants. Enjoy! Mountain tribes used the leaves and roots as well, mainly as poultices and as antidiarrheal teas. 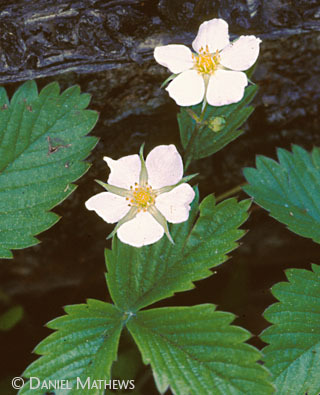 Commercial strawberries are a complex hybrid derived mainly from two other species native to the Northwest: F. chiloensis of the coastal lowlands, and F. virginiana of the interior. None of them had big berries before the breeding began.